Episode 37: Let’s embarrass ourselves! On this episode, we look back to some of our more embarrassing music and movie picks of years past. Discussion of the VMA’s, our upcoming trivia championship, and the longest list of Coming Soon in this history of The Scope! Our impeccable taste in movies and music is put to the test… 15 years ago! Tobey Maguire and Shane share a love for giant robots. The guy that wrote and directed Van Helsing is bringing GI Joe to the big screen. Music Industry’s idea to save itself: Ringles. Nintendo back on top in video game industry. Wii Zapper release date and price. Remember you can now comment via phone! Give us a call at 206-350-7056 and leave a message. Drunk Dialers Preferred. Of course you can still email us at comments@thescopeshow.com or post below. Are you able to recall all of Howard Hessman’s students on Head of the Class? Can you list the first-party games for the Nintendo Entertainment System by release date in reverse chronological order? Then The Scope wants you! The Scope is now recruiting participants* for the 2007 edition of The Scope World Series of Pop Culture. We are looking for teams as well as individuals who are willing to challenge the defending champs for the crown. Shows will be taping in October and November, so contact us today! The new 4th member of the show (Molly) stops by yet again to help preview the upcoming Fall television season. We discuss some of the pilots we’ve manage to see, as well as our picks for Most Excited About and First To Be Canceled. Also, our “Date-a-Molly” contest is in full swing. Weâ€™ve made our picks for â€œFirst New Show to be Canceledâ€. Who will win the huge cash prize? Kevin Smith set to ruin two shows. 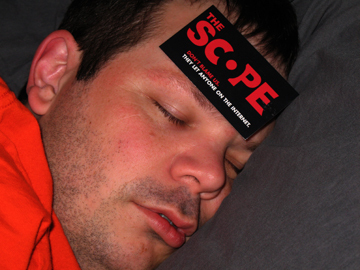 Scope episode 36 delayed for one week; hosts beg for forgiveness. Yes, it’s true. In what some would call laziness (and that’s just what Adam says), we’re holding off recording and posting our latest episode of The Scope until the first weekend in September. While this news more than likely brings great sadness, we’re happy to report that episode 36 will be jammed packed with all sorts of super fun content. As you read this very post, feel confident in knowing we’re preparing The Scope 2007 Fall TV Preview. We’ll tell you all you need to know about the upcoming television schedule. And we’ll do it with a smile. Or grimace. We’ll also have a review of the late summer blockbuster, Superbad. Did we “get it” like all the young hip kids “got it?” You’ll just have to wait a few extra days to find out. In the meantime, take a look at some of our exclusive online reviews, listen to old episodes of The Scope, and make a difference in the world. That’s really what it is all about. 2007 Marks the 25th Anniversary of the “G.I. Joe: A Real American Hero” line. 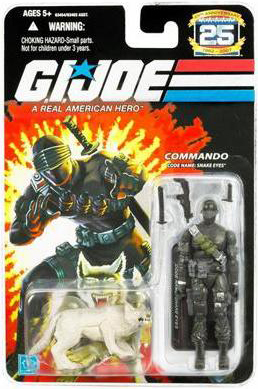 To commemorate the event, Hasbro released all new sculpted 3 3/4″ figures based on the more popular characters such as: Duke, Scarlett, Snake-Eyes, Gung-Ho, Roadblock, Cobra Commander, Destro, Baroness, and Cobra Enemy Trooper. These figures feature more articulation and are reminiscent of their original incarnations. Are the G.I. Joe 25th Anniversary action figures worth your time? On this episode we debut a new (to us) game, based on the one you may have heard on I Love Movies, Doug Benson’s old podcast. Molly stops by again, as well as a return visit from John and Earl. Microsoft adds HDMI to the top end XBox 360. Man sneaks monkey into airport. Hilarity ensures. Ladies strongly prefer pretty men to tough men… ok but what about the rest of us? Episode 34: Snape did WHAT in book 6?!? 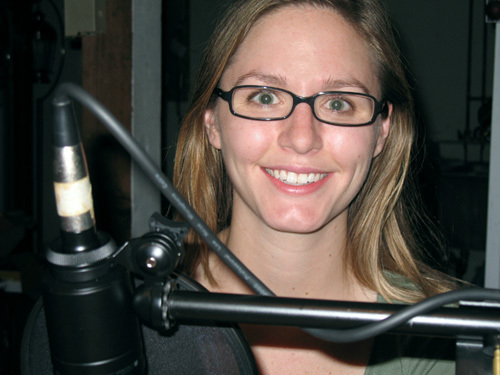 We set a new record for nerdy podcasts by getting to double digits in female guests with Shane and Adam’s co-worker, Molly. She stops by for our huge Harry Potter show, where we talk about the books, the movies, what’s next for Mrs. Rowling, and even have a little trivia. Also Shane and Jared wax nostalgic about some shady newsstand. It’s cool, they’re just dogs, amirite? Episode 33: The last 90 minutes of Transformers discussion ever! Maybe! Probaby not! We close up the Transformers discussion by looking back at our Instant Review from a week and a half ago, as well as reviewing the original Transformers movie. Plus, Shane’s best week ever, E3 talk, and a CONvergence recap. It’s been said that you are either a Beatles person or an Elvis person, so which are you?